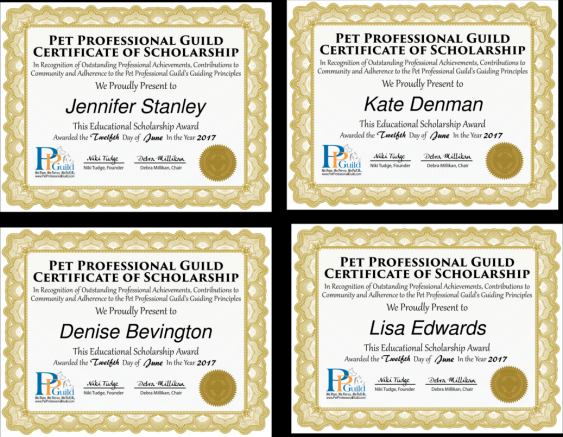 WESLEY CHAPEL, Fla. - June 13, 2017 - PRLog -- The Pet Professional Guild (PPG) has announced the names of the first ever candidates to be awarded under its Education Scholarship Program. Launched in January, the program provides a limited number of scholarships for PPG members to further their education in force-free training, behavior consulting and/or pet care offered by organizations that support PPG's Guiding Principles and goals, and are approved educational providers to PPG. This year's recipients, Kate Denman, Denise Bevington, Lisa Edwards and Jennifer Stanley, have been notified of their success and are set to embark on their education in the next six months. The successful candidates have been awarded as follows: Denman, based in Adelaide, South Australia, Australia, will study online with DogNostics eLearning; Bevington, of Levine, Arizona, will study online with The Academy for Dog Trainers; Edwards, based in Launceston, Tasmania, Australia, will study online with Behavior Works; and Stanley, of Greensboro, North Carolina, will study part online and part in situ with the Karen Pryor Academy for Animal Training and Behavior in Durham, North Carolina. "Although it is only in its first year, our Education Scholarship Program attracted an incredible number of eligible applications, which made the award process very difficult," said PPG president, Niki Tudge. "It took a great deal of deliberation on the part of our scholarship committee, chaired by PPG steering committee and board member Debra Millikan, to make the final selections and objectively review each applicant, and I am happy to report we have been thanked by the various educational institutions for providing such a high caliber of candidates. "In an unregulated industry such as pet training and behavior, it is essential that PPG members provide the highest quality, state-of-the-art, force-free, science-based behavior consulting, training and pet care services to the pet owning public. The PPG Education Scholarship Program, and its support of the professional development and continued education of our members, is a key part of that mission. By studying with these top-echelon education providers, we can ensure our scholarship recipients' skills remain up-to-date with current research in the fields of animal behavior and training, and thus serve as an invaluable resource to clients and their pets. At the same time, PPG members all over the world continue to work as ambassadors and practitioners of the force-free message as we collectively work towards a world free of unnecessary, outdated, aversive training methods or equipment and a better, kinder world for pets." For more information about PPG's Education Scholarship Program and details of how to apply, see http://www.petprofessionalguild.com/Scholarship-Program. The Pet Professional Guild (PPG) is a 501(c)6 international member organization founded on the principles of force-free training and pet care. Its membership represents pet industry professionals who are committed to force-free training, pet care philosophies, practices and methods. Pet Professional Guild members understand force-free to mean that shock, pain, choke, fear, physical force, or compulsion-based methods are never employed in training or caring for a pet. Full, associate, and provisional PPG members across all training and pet care specialties are deemed eligible scholarship applicants, provided they are a current member and in good standing for a minimum of 12 months. PPG must receive scholarship applications between March 15 and April 15 any given year via an online form. All applications will be reviewed by the scholarship selection committee, which includes members of the PPG education committee, the PPG steering committee and a PPG board member. Final scholarship recommendations will be forwarded to the PPG board of directors by May 15 of any given year, and the board of directors will notify all applicants of the outcome of their applications no later than June 15 of the year in question. Scholarship funds are remitted directly to the educational provider and not the candidate.